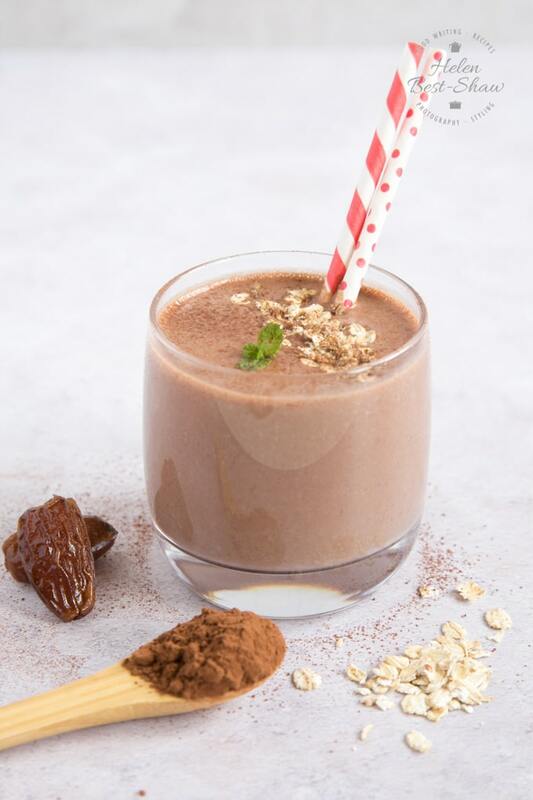 A delicious way to start the day; this chocolate and date smoothie looks more indulgent than it is. Richly flavoured with cocoa, it’s packed with slow release energy from oats. Treat yourself to this tasty morning boost in place of your usual breakfast. Sometimes, particularly when I’m in a hurry, I like to start the day with a smoothie. Drinking, rather than eating my breakfast is a great way of clawing back a few extra minutes in the morning rush. 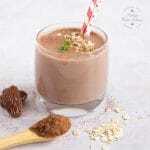 This chocolate smoothie is thick, satisfying and delicious; it’s chocolate for breakfast made healthy and tasty too, like drinking a spiced chocolate oaty biscuit. 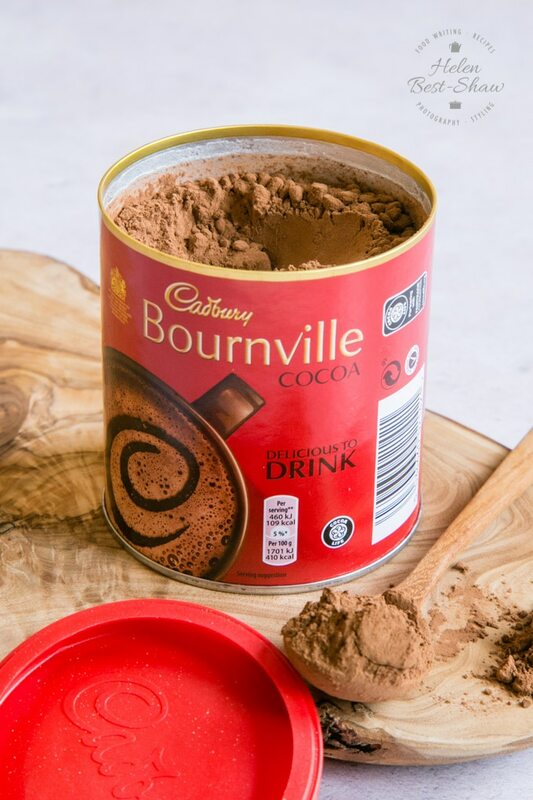 By using Cadbury Bournville Cocoa powder also I’m supporting the Cocoa Life campaign, which was set up to help cocoa farmers have a better life, and produce sustainable cocoa. Not a bad way to start the day – a delicious breakfast that does good for others! How do you make this chocolate and date smoothie? If you have a power blender, it’s a simple, one stage process. Assemble the ingredients. 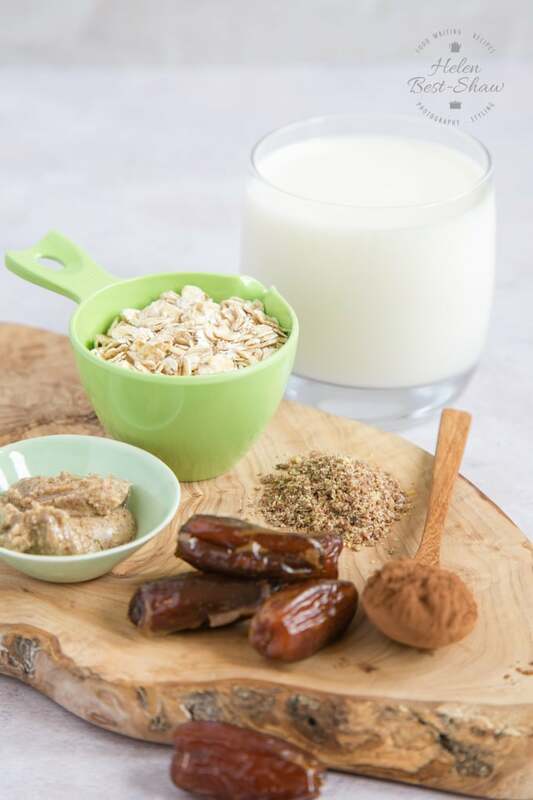 Your choice of milk, oats, cocoa powder, dates, ground flax seeds and a dollop of peanut butter. Place them in the jug and blend to a smooth consistency. If you don’t own a power blender, don’t worry! Simply soak all the ingredients together overnight, for at least 8 hours, and then the smoothie will easily blend with a regular stick or jug blender. 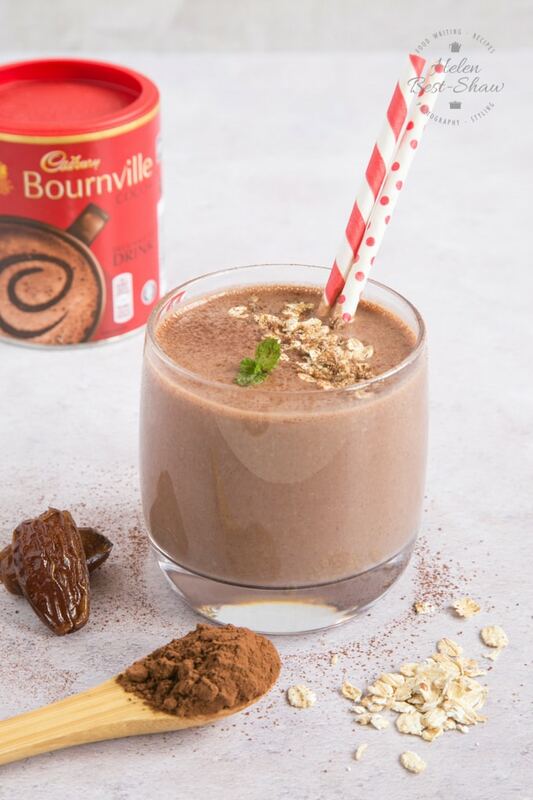 In my smoothie I’ve used Cadbury Bournville cocoa powder which carries the Cocoa Life logo. Cadbury is one of the UK’s best loved brands and was founded on principles of generosity and kindness. The Cocoa Life programme is the embodiment of this philanthropic ideal in today’s world. I love the idea of doing what I can to support worthwhile causes; and if choosing a different chocolate can help make a difference, then I’m all for it! Cocoa is an essential part of this smoothie, so without cocoa farmers I would be struggling. Cadbury are part of the Cocoa Life programme aimed at securing the future of cocoa supplies and equipping cocoa farmers with the means and opportunities to provide a better live for their families. Cocoa farming is facing a challenging future, with ageing trees, loss of soil fertility and a changing climate all leading to low productivity and income for farmers. This means farming suffers from poor investment and development, and a lack of enthusiasm for the young to take up cocoa farming. It’s a vicious circle. Cocoa Life is a programme aimed at generating a virtuous circle to break this trap, where supporting farmers helps improve their livelihood, leading to them protecting the landscape and environment, and transforming their communities, enabling their children to go to school, and encouraging them into cocoa farming as a job with a productive future. The growing Cocoa Life programme is operating around the world, helping farmers ensure their future and the future of cocoa farming. I’m especially interested in reading about how the Cocoa Life is helping the next generation of cocoa farmers with their education. There’s more information online at https://www.cocoalife.org/. All I have to do to support this really worthwhile program is to look out for the Cocoa Life sign when I buy chocolate. It’s on an increasing number of Cadbury products. If you try this Chocolate & Date Smoothie please tag #FussFreeFlavours on Instagram or Twitter. It is amazing for me when for me when you make one of my recipes and I really do love to see them. You can also share it on my Facebook page. Please pin this recipe to Pinterest too! Thanks for reading Fuss Free Flavours!